Here's a fun afternoon project to brighten things up! This is the first room makeover I did in our new place. Thanks to the contractor white paint, just about every room was a blank canvas. 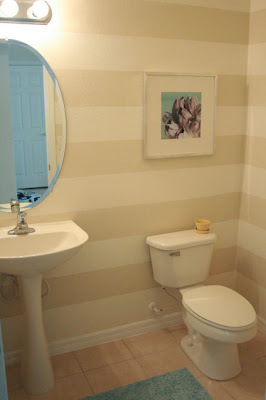 The downstairs bathroom is a small room, so I wanted to make it appear bigger using some stripes! The ceilings are pretty high (vertical lines would make the room seem taller) so I wanted to make it appear wider using horizontal lines. When shooting in Savannah, GA several months back, we stopped at one of my favorite shops - The Paris Market. 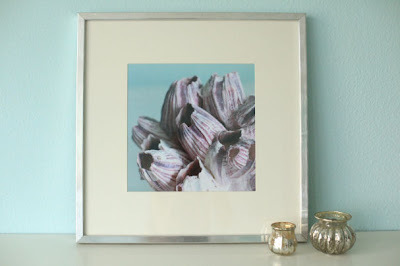 I found this super colorful barnacle that I thought would be an awesome accessory in my airy, beachy new place. I love it so much that I wanted to use it more than once! I took a close up picture of one of the sections and made a unique print for the bathroom. 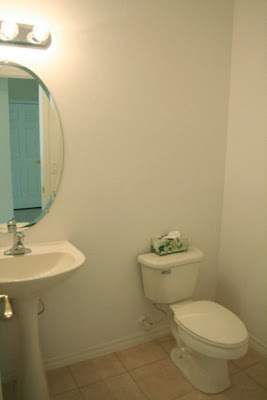 Here are the before and after pictures of the bathroom!! Isn't it amazing what a little paint & blue tape can do? We got married - AGAIN!